Ever since the movies Animal House the theme toga party has been a college party classic and is ingrained in college party culture. Animal House really set the bar for those crazy toga parties and helped put this theme in college party history. Most people make their toga, all you need is some fabric or a bed sheet but you can also buy one online if that is more your style. This theme is a real easy one. All you need is some shorts and bed sheets or fabric for a local store. Take the sheet and wrap half the sheet around your waist and tuck part of the sheet in your shorts to hold it in. Then take the rest of the sheet and bring in over your shoulder from the front, bring it down your back and tuck it in where you have already wrapped the sheets around your waist to hold it in place. Another option is to place one end of the sheet over your shoulder so that it dangles in front of you to your knees. Then bring the rest of the sheet behind you and across your back under your right arm. Drape the sheet across your front and throw the other end over the left shoulder. Arrange the folds so they look nice. You can always grab a girl to help you out. Then take some of the left piece and tuck it into a belt to keep it in place. Girls have a lot more options when it comes to a toga party. 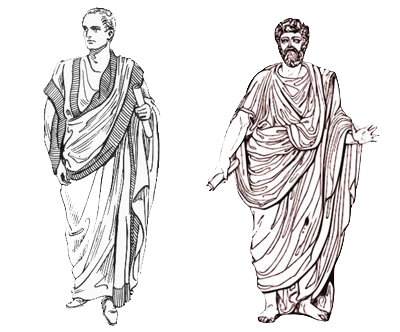 They can dress in a full bed sheet like the guys but they can also choose to show a little more skin and make a two part toga out of fabric. If you choose to make it out of a bed sheet wrap the sheet around your chest and waist and tuck in into some underclothes or keep it in place with a belt. You also will need a few pins to keep everything in place so it doesn’t unwrap. The second option for girls is to make a two part toga out of some fabric from a local fabric store. Don’t worry this is cheap to do. All you need is two pieces of fabric a yard across and long enough to wrap around your body at least 1.5 times. Take one piece and wrap it around your bust and secure it in place with some pins. Make sure it is really in place because things won’t go to well if your top piece falls off while you are dancing later in the night. Take the second piece of fabric and do the same but this time wrap it around your waist. This lets you show a little skin by leaving your midriff showing.